Inveresk had plans to build its own parish poorhouse from the mid-1850s. However, in 1862, it formed the Inveresk Combination in conjunction with the seven other parishes of Gladsmuir, Humbie, Ormiston, Pencaitland, Prestonpans, Salton and Tranent. They were subsequently joined by Duddington (1874) and Haddington (1875). The total population of the member parishes in 1881 was 37,160. Duddington later became included within Edinburgh. The Inveresk Combination poorhouse was built in 1862-3 at a site to the south of Inveresk. Its location and layout are shown on the 1908 map below. The design appears to have followed the layout typical of many Scottish poorhouses. The H-shaped main block faced to the south-west. At its centre would probably have been the Governor's quarters with the dining-hall and kitchen behind. Separate male and female accommodation was provided at each side. 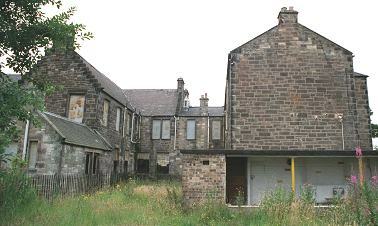 At the rear of the main building were various utility rooms and workshops. Inveresk from the south-west, 2001. Inveresk from the south-east, 2001. 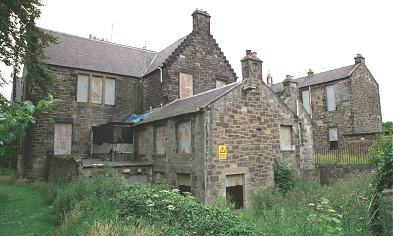 Inveresk from the east, 2001. Inveresk from the north-east, 2001. After 1930, the poorhouse became Inveresk Institution, under the administration of a joint committee from Midlothian and East Lothian. In 1946, it had 160 beds including 15 male and 15 female for chronic sick, and 15 male and 15 female for certified lunatics of the 'quite type'. The buildings, latterly known as Wedderburn House, have now been redeveloped for residential use. East Lothian Archives, John Gray Centre, 15 Lodge St, Haddington, EH41 3DX. Has Inveresk Combination Institution minutes (1945-1949).